Summer Dental Care Quiz: Are You Taking Care of Your Teeth? Learn how to protect your teeth all summer with this short quiz. There’s nothing like a blue, cloudless sky on a sunny summer day to relax you into summer mode. Sitting outside, sipping a drink of cold, sweet lemonade and going to the park with the family are just a few images of luxury that warm weather can bring. But don’t let your new groove throw off your summer dental care routine! Dental care is one of those things in life that, if you put a little bit of time in every day and pay attention to a few details, you avoid lots of pain and out-of-pocket costs in the long run. While it can be tempting to slack off during vacation or certain months of the year, the truth is that dental care couldn’t be more important during this time. We’ve prepared a short quiz to help you evaluate whether you really know how to take care of your teeth in the midst of summer’s enticing options. Answer TRUE or FALSE for each statement below, and then scroll down to find out how you did! FALSE. 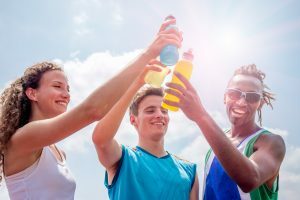 When you’re sweating, the first thing you want to reach for is a sports drink. But before you chug it down, think of the effect it has on your teeth. Many sports drinks have sugar as their #1 ingredient. If you’re dying for a water alternative, look for a sports drink that is low in sugar, or choose flavored water instead! TRUE. While ice feels like your best friend on a hot day, chewing ice is not the way to go. People who chew on ice and other hard substances put themselves at risk for a dental emergency such as broken teeth. Ice also chips away at enamel. FALSE. Nothing says “summer” like a tall glass of lemonade, but take care: frequent exposure to the lemon’s acid and the sugar in lemonade can hurt your teeth. Most people know that limiting sugar is key to protecting teeth. Frequent exposure to acids can also erode your enamel, weakening teeth over time. Our advice? Choose a low-sugar lemonade and drink only occasionally. FALSE. You don’t need to put pressure when you floss; in fact, this can be damaging if you have sensitive or thin gums. The important aspect of flossing is bringing the floss all the way down to the gum on both sides of the gap (first against one tooth, then against the other). When you bring it up, you will often see a yellowish or whitish goo. You should use a different part of the floss next or otherwise wash it off before you continue so that you don’t re-distribute the bacteria. That goo is what you’re trying to get rid of, and flossing is what protects you against plaque buildup! TRUE. It is recommended to brush twice a day because this facilitates regular removal of the bacteria that collect on your teeth. However, it´s best not to do so right after eating because eating softens your tooth enamel. Taking a toothbrush to that softened enamel can damage it, so we advise that you wait 30 minutes after eating. Right before bed and right away when you get up is a good routine for summer dental care – not to mention all year long! We hope that these tips help you to make educated choices about your own health and teeth this summer. Don’t throw out summer dental care when the sun comes out, and your teeth will thank you!